The Scottish Targe is a round shield widely just referred to as a targe. The targe is traditionally twenty inches in diameter. The Clansmen of Scotland when constructing a targe, they would select a hard wood of two types and cross the wood grains into two layers and join them together to improve the strength of the targe. This became a very strong means of defence. Scottish shields have been in use since far back to the first king of Scotland, Kenneth MacAlpin in the year 843 and beyond that year. Coming through the ages in Scottish history, the shield changed its shape from round to King Robert the Bruce’s famous shield used in the Battle of Bannockburn in the year 1314. 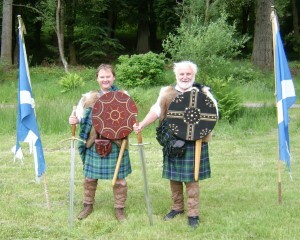 Then the Scottish Clansmen as far back as 1623 were using a shield called a targe. A targe is known all over the world now and symbolized in history in the tragic Battle of Culloden in 1746. Since the targe came into history in the year 1623, the Clansmen, when knowing they were in danger of their enemy, they had a targe. It could defend you from sword blades, musket balls, and to the end grape shot. The targe is covered in cow or deer hide and decorated with nail heads. In history the Scottish clansmen did not have special designs to every clan to own targes, it was if you could afford to make one and find the time to design your targe then you did. Some people adopted one another’s designs. There would have been Targemakers trading to the Clansmen. Clansmen had to trade meat, money, or weapons for targes. Then owning a targe was good protection. There skins were possibly dyed in colour using coal, peat, paint pigments, or blood rubbed into the skins of the targe. It has been known when the Jacobites of the 17th century killed a redcoat government troop, they would decorate their targes with the red material and the buttons from the tunics of the dead soldiers. After decorating their targes, the sight of the Clansmen approaching the redcoats would terrify them of the sight of the targes looking like they were covered in blood, but it was the tunics of their comrades. In the middle of some targes, there are brass bosses with a thread that could take a spike that was screwed in. This worked excellently in the great Highland charge. The Clansmen were famous for their charge holding their spiked targe, a dirk blade, their basket hilt, and broad sword all of this in their hands while running at their enemy. In some cases they would use pistols or muskets. 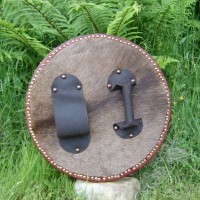 The back of the targe is covered in deer fur to reduce impact to the hand. On top of the fur there was a wrist strap and grip handle and also a sheath for their targe spike when not in use and a strap to carry their targe over their shoulder. 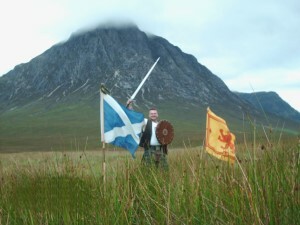 I am a proud patriot of Scotland and proud to be a Clansman McNeill of the Isles who fought along side King Robert the Bruce at Bannockburn 1314. 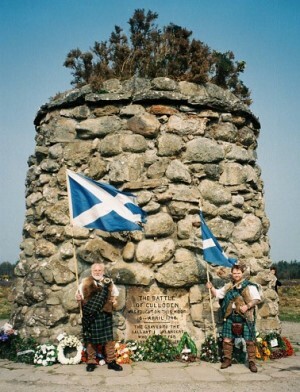 Very violently, my fore fathers fought at Culloden 1746 where one hundred and fifty perished at the battle. My targes pay respect to our fore fathers and keep the memory of these patriots up as well as helping those around the world seeking the Scot in them. Our family is a member of various societies aiming to keep Scottish history alive and told on from generation to generation. We supply and take part in reenactments and other events to safeguard our heritage.